The Turtles are outside practicing in a park when a strange orb crashlands into a nearby pond. The TMNT dive into the water and rescue a strange looking alien from the sinking globe. The Shredder is watching the whole episode while concealed within the brush. The alien revives long enough to tell the Turtles that some sort of artifact called “The Eye of Sarnath” had seperated into 3 parts during the crash. If these sections were to be joined together, they could be a terrible power on the Earth. The alien then gives the TMNT a device called the Crystal Converger that will help them locate the fragments of the Eye. Shredder overhears this, and sets off to find the pieces before the TMNT can. The Turtles follow the path given to them by the Converger, which leads to a garbage barge. The Heroes in a Half-Shell hop into the drek to search for the Eye fragments. Don retrieves a section, but then Shredder shows up and takes it. As the TMNT prepare to fight for the fragment of the artifact, Shredder inadvertently activates its powers and shrinks the Turtle boys down to action figure size! 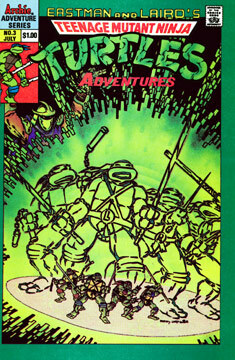 Shredder prepares to squash our heroes, but they manage to escape with the Converger and make it home to the sewer. Splinter calls April for help, and the pair head off in the Turtle Van to find Saki and get the fragment from him before he can do more harm.